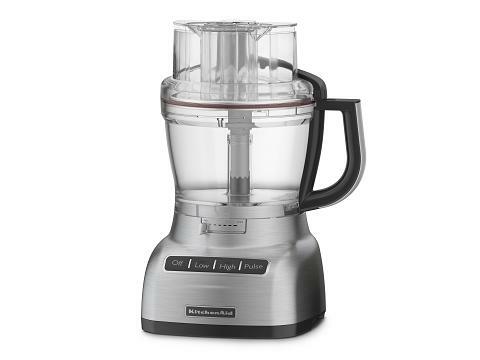 I would love the new KitchenAid 13 Cup Food Processor for Christmas (hint hint Mom if you are reading this!). KitchenAid is a brand I know and trust and you can always count on a quality product. Plus a food processor would be so convenient to have when preparing holiday dinners. Here’s a bit more about the KitchenAid 13 Cup Food Processor that one lucky Canadian reader is going to win! It retails for $399 and is available this month in stores that carry major appliances. It comes in silver, white and black. If you have someone who loves to cook on your list, consider picking one up for them as a gift this holiday season! A yummy recipe you can prepare using your new food processor- Holiday Slaw! This crunchy slaw with its sweet and tangy vinaigrette is a delicious and refreshing accompaniment to serve with turkey and trimmings. Using your food processor makes the preparation very easy and this salad can even be made days in advance. 1. Cut the cabbage into 5 or 6 wedges. Position the adjustable slicing disc in the work bowl and, using the thin setting on High speed, push the wedges through the feeding tube. Transfer to a large bowl. Switch to the coarse side of the reversible shredding disc. Cut the fennel into quarters. Push the fennel and radishes through the feeding tube; add to the large bowl. 2. Cut the green onion and green pepper into chunks. Use the multipurpose metal blade to chop finely. Add to the cabbage mixture. Combine the cranberries, vinegar, oil, maple syrup, lemon juice, mustard and salt in a small saucepan set over medium heat; bring to a boil. Pour over the cabbage mixture and toss to coat. Chill for at least 1 hour or up to 4 days. Makes about 12 cups (3 L). This is a fantastic giveaway before Christmas, Stacey! What I find fascinating is that you are clearly a strong and successful Canadian blogger, and I haven’t heard of you, nor you, of me! Bazaar! Giz tweeted this out and I follow her – so thankfully, I have found you now! Congratulations on this coup! my moms 7 layer bars. They are yummmmmy!!! i love sweet potatoes. pumpkin pue! I like peanut butter balls – my favourite. I LOVE my mom’s homemade stuffing! It’s a requirement at my house…lol. My favorite holiday treat are white chocolate macaroons, and nanimo bars. I LOVE Shortbread cookies with milk chocolate centres! I love sweet potato casserole. It’s perfect with dinner and for dessert! My favorite and our tradition…rum cake. Using Barcardi Gold. My favourite is plum pudding with rum sauce. I’m going to have to develop all new holiday favorites since this is my first year Gluten Free (a food processor would sure help with this). I’m going to try shortbread since I loved it before. My favorite holiday treat is homemade gingerbread cookies. My favorite is homemade chocolate fudge! I love candy cane ice cream! I love candy cane ice cream with green, red, and white sprinkles. I love all the meat and cheese assortments! I love homemade fudge. I like to make it to give as gifts, too! I love peanut brittle also ! Favorite treat is Peppermint Bark. My fave is Oyster Dressing, as it is to die for!